Hoyt Arboretum contacted us about a tree they were having to remove. They wanted to know if we could mill it into landscaping timbers for a new trail system they were building. They provided a list of materials needed, while we put together a salvaging and cutting plan. They were able to get everything they needed out of that one tree to complete the project. 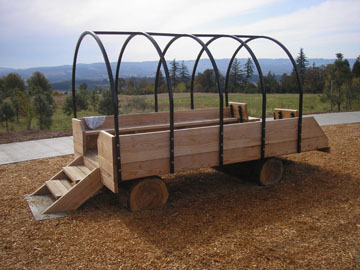 A covered wagon childrens play structure became a new edition at the park after a mayor renovation. A new parking lot with bioswales, trees planted, trails extended, and a play area for kids. 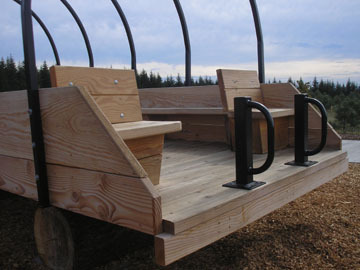 The log wheels and fir lumber were all provided by TreeCycle NW. 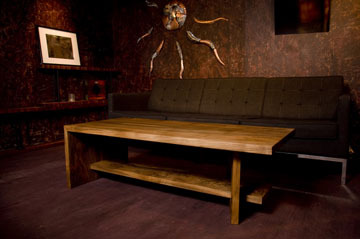 Custom designed and handcrafted english walnut coffee table. 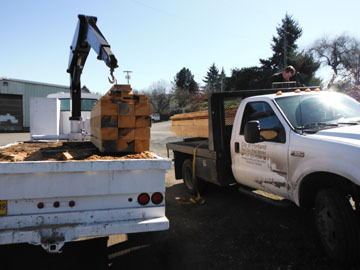 English walnut tree was recovered from a residence in Vancouver. 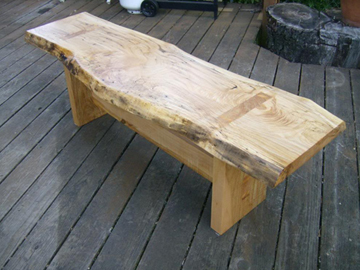 A beautiful live edge slab makes this piece a one of a kind work of art as well as being a functional bench. The construction was all mortice and tenon and without the use of metal hardware.